Do you ever get sick of seeing people always doing or getting things that always seem the same as what everybody else is doing? We are! 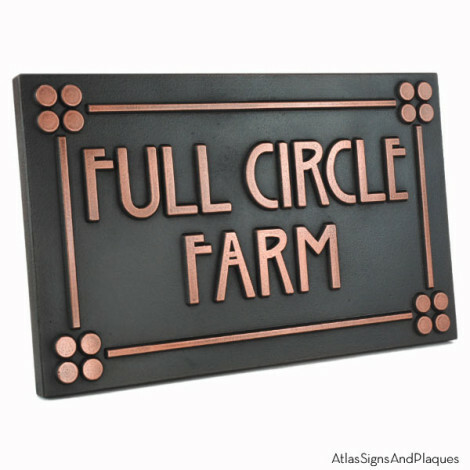 Fix the problem by getting a custom made plaque from Atlas Signs and Plaques. It doesn’t need to be extremely different from everything you have seen, sometimes just changing something just a little bit can make the world of difference. For example, the plaque above is a combination of our craftsman style with our stickley phrase plaque; throw in the fact that the squares are circles and you have a completely original plaque for yourself. For other custom designed plaques by AtlasSignsAndPlaques, please click here. This entry was posted in CUSTOM Projects and tagged craftsman style, custom, decorative, finished, just for you, metal coated, personalized, stickley phrase on September 10, 2014 by AtlasSigns.